21Things4Students is a web-based resource developed by Macomb Intermediate School District, Ingham Intermediate School District, and Shiawassee Regional Educational Service Agency, in collaboration with the Michigan REMC Association. 21Things4Students consists of 21 instructional modules or “Things” that address areas of technology use with embedded project-based activities and assignments. Students using the 21Things4Students resource create individualized digital portfolios with evidence of their proficiency, and have an opportunity to earn digital badges that reflect their accomplishments. Teachers can choose to use the various modules collectively as a ready-to-go technology course, or separately as a set of resources for increasing student proficiency in targeted technology skills. The project also provides support for teachers who may need technology skill support while using the 21Things4Students in their classroom by cross-referencing resources with tutorials provided in a companion project, 21Things4Teachers (also an ISTE Seal of Alignment awardee). 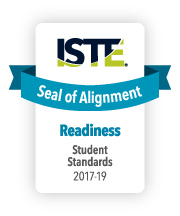 21Things4Students successfully underwent the International Society for Technology in Education (ISTE) Seal of Alignment review for Readiness. Reviewers determined this resource helps build foundational technology skills needed to support the ISTE Standards for Students. 21Things4Students is a free project-based curriculum resource with a focus on improving technology proficiency among students in grades 5-9. The material is well organized, rich in content, and easy to use. Addressing a wide variety of skills including technology basics and sophisticated concepts, students that successfully complete the curriculum will be well equipped to engage in instructional efforts in which technology is applied as a robust learning tool. The quests themselves are both appropriate and engaging for the target student population, and user motivation is easily maintained with badges and certificates to award to students as they progress. After careful review of the curriculum, reviewers concluded that this resource fosters the development of a strong, broad foundation of technology skills and 21Things4Students was found to support all the ISTE Standards for Student indicators. "21Thing4Students is flexible, engaging, free, and effective. Whether adopted in whole or in part, it would make a valuable addition to any school's technology training resources." This resource helps build foundational technology skills needed to support the ISTE Standards for Students.